Some unexpected animals are loafing on beaches near Port Heiden this spring, and their numbers seem to be fluctuating. The Bristol Bay village on the north side of the Alaska Peninsula first reported seeing walrus hauled out in early April. Village resident John Christensen was riding his four-wheeler when he first spotted them. “We went for a ride up the beach and ran into a large amount of walrus, a few hundred of them. We’ve never seen anything like this here before,” Christensen said. Over the course of a month, the residents saw more groups of the ungainly marine mammal resting on the shores from Hook Lagoon to Strogonof Point. Alaska Department of Fish and Game area management biologist Bob Murphy flew May 1 the shoreline from Pilot Point to Port Moller. Walrus pods are prone to stampeding off a beach and into the water if disturbed, which can result in some animals trampling others. The Marine Mammal Protection Act protects walrus from harassment to guard against needless death and injury. Harassment could include noisy fishing boats passing too near to the resting walrus. In the Ugashik District, for example, Fish and Game changed the line for the commercial salmon fishery in 2016 and 2017 when more than a thousand walrus hauled out at Cape Greig. The amended boundary allowed the walrus and boats a one-mile buffer zone. It is too early to rule out such a measure for the Alaska Peninsula Area, or to know to know whether the walrus will even be there in a few weeks. According to the U.S. 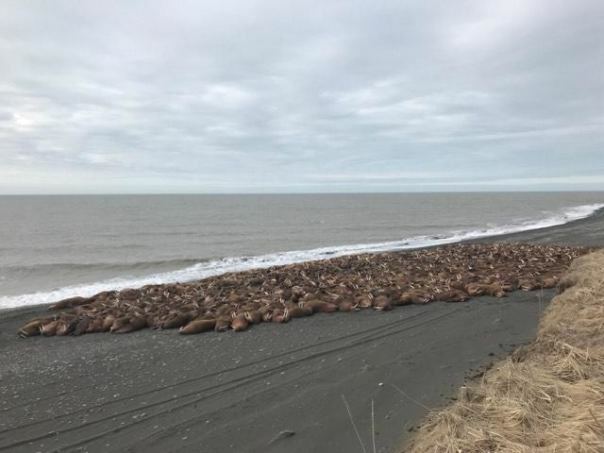 Fish and Wildlife Service, walrus have hauled out near Port Heiden before, but it has been about two decades. As Port Heiden residents wait to see whether their new guests are here for the summer or just making a pit stop, they say that they are keeping their distance to ensure they don’t disturb the animals.